Microsoft Surface Go is now available in India for pre-order exclusively via Flipkart. The tiny Surface Go laptop is the smallest and most portable laptop Microsoft has ever made. The laptop can be used in various ways because of its small size, that also comes with a very lightweight, at only 522g. Microsoft Surface Go runs on Windows 10 Home in S mode. It comes with a 10-inch, 1800×1200 HD display with 3:2 aspect ratio, 10-point multi-touch, and Corning Gorilla Glass 3 protection. It comes with Intel Pentium Gold 4415Y processor with Intel’s HD Graphics 615. Microsoft Surface Go is available in two different RAM and storage variant. The first one comes with 4GB RAM and 64GB eMMC storage, and the second one comes with 8GB RAM and 128GB of SSD storage drive. The 4GB RAM and 64GB storage variant are priced at ₹37,999, while the 8GB RAM and 128 GB storage variant is priced at ₹49,999. The laptop features a 5MP front camera and 8MP auto-focus rear camera. 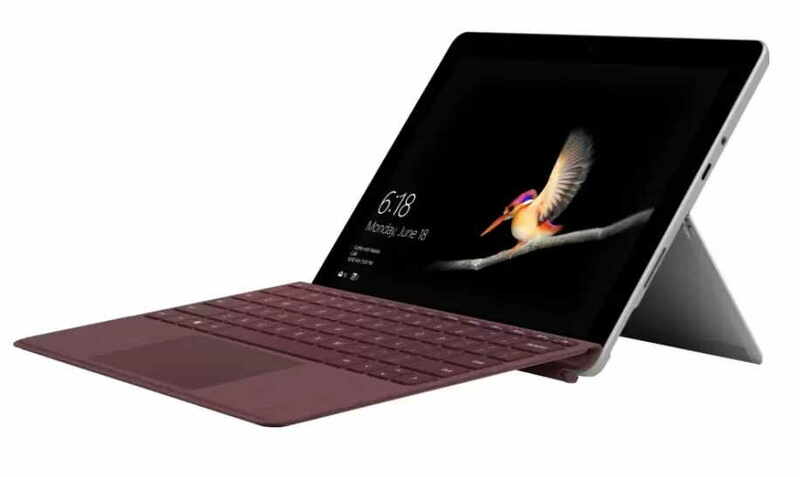 For the connectivity options, the Surface Go features 1 x USB-C port, a 3.5 mm headphone jack, Surface Connect port, Surface Type Cover Port, MicroSDXC Card Reader. Wireless connectivity options includes, Qualcomm Atheros (QCA61x4A) Wi-Fi 802.11 a/b/g/n/ac and Bluetooth 4.1. Surface Go is now available for pre-order in India exclusively via Flipkart starting from 12:01 pm on December 15, 2018. There is also a black Surface Go Cover which you can buy separately for at ₹8,699. There is another Surface Go Signature Cover which is an available price at ₹11,799.